Organizing a children's room correctly is not an easy task. To achieve unnecessary luxury is not difficult at all, but it is hardly necessary for the little inhabitants of this space. Fortunately, the recipe for creating practical and stylish interiors was found by residents of Northern Europe, who have been delighting the world with their projects since the 1930s. The Scandinavian style that we have in mind is more than just an interior design scheme - it is a way to create your own idyllic, elegant and functional space, ideal for both leisure and work. . Implement the Scandinavian style in the interior of the nursery is no more difficult than in any other areas of the house. 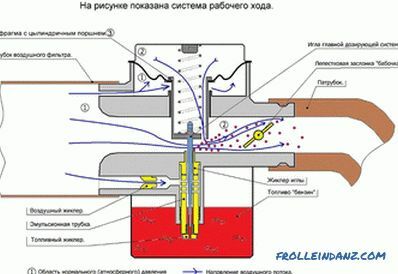 But there are also its own features, which will be discussed today. 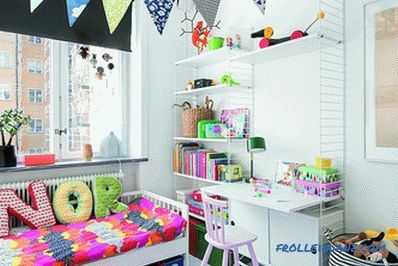 When designing a children's room in the Scandinavian style, you should think not only about the color scheme of the room, but also about smart interior solutions. 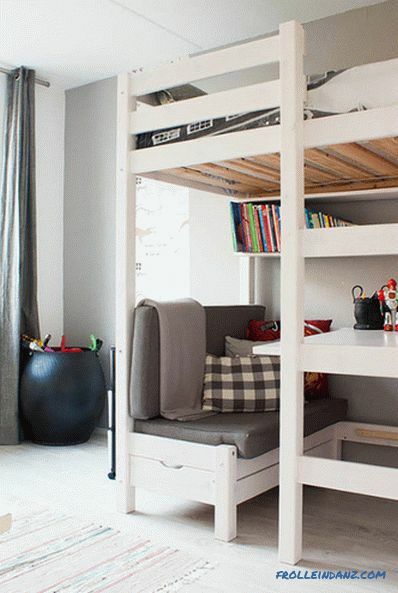 In this children's room, a raised bed frees up space for a table, two neat benches and a bookshelf. 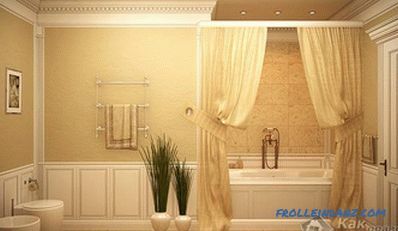 Consider making furniture to order, especially if the area of ​​the room is small. 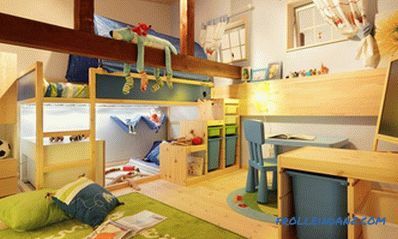 A room designed for children should perform several important functions. First of all, children should feel safe here. Secondly, this is a space for entertainment and games, so it can not be boring. Thirdly, this is a place for homework, so it should not be distracting with a wealth of flowers and ornaments. The organization of the space in the Scandinavian style allows you to combine all three aspects. An important advantage of this style is the brightness of colors and the refinement of textures and shapes. In Scandinavian interiors, natural materials are used, such as wood, wool, flax, whose presence in the children's room is welcome, because thanks to this small family members will live in harmony with nature. Plastic chairs and metal tables are replaced with furniture made of fir, spruce or oak. Whether to keep the original appearance of the wooden surfaces or paint them with white or pastel paint, you decide. It is better to finish the wood with the floor, and to leave it in its natural form, as is the case with furniture, except to protect it with a layer of varnish. Subtle, monochrome colors in the workplace will allow the small student to focus on their studies. Do not forget about the proper lighting of the workplace. Scandinavian style focuses on natural sunlight - no curtains and blinds are needed in the room. In addition, the interiors are also illuminated with lamps, the light of which, reflected from the smooth walls, creates a warm aura. The child is just waiting for the moment when, having finished homework, he will finally start the game. The place where he will spend his free time should be organized in such a way that the game is safe and at the same time enjoyable. Children like bright colors, but their excess can be tedious. However, in the Scandinavian interior bright colors and bold forms appear only in accessories. A colorful carpet, wallpaper with a pattern, wall paintings or graphically simplified posters and paintings will breathe life into the refined interior. Soft blankets and carpets, pillows with a soft texture and funny teddy bears will bring joy to children, making the space more welcoming and friendly. 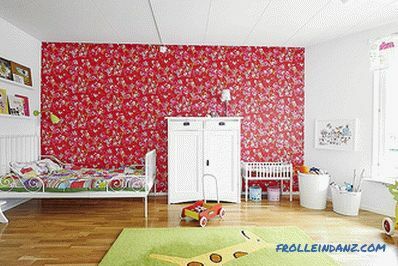 If you decide to arrange a nursery in the Scandinavian style, select the room with the largest window for your child. In the northern latitudes there is so little sunlight that the windows there never curtain with thick curtains. 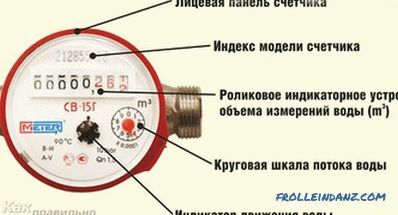 And if your apartment is not located on the ground floor, which means that people do not pass by your windows continuously, you can do without curtains at all. Fill the room with sunlight! Do not forget about artificial lighting, here you can use all kinds of chandeliers, wall lamps, floor lamps and table lamps. This is especially true in the winter, when more than half of the day outside is dark and gloomy, but there should be no dark corners in your child’s room. Scandinavian style interiors are characterized by a natural and calm color range. 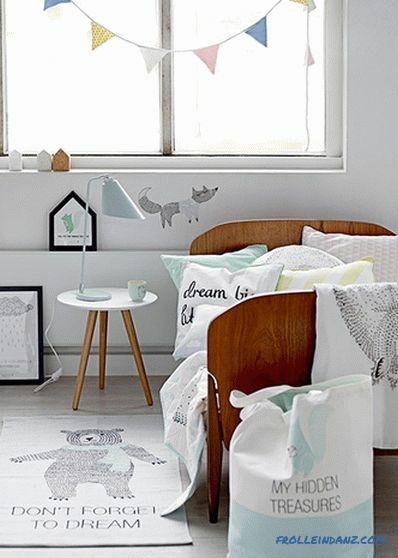 Natural shades are ideal for decorating a child's room. White will remind your child of summer clouds, yellow - a walk along the seashore, and gray will be associated with cloudy skies and cold waters of the Norwegian Sea. Speaking of gray ... 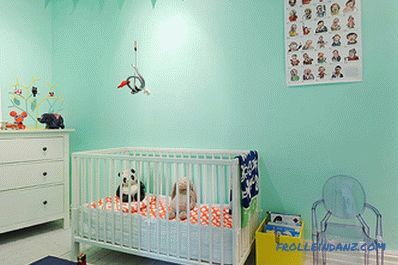 In the color scheme of the Scandinavian style, this color often coexists with white, and this combination works well both in the nursery and in the rest of the house. But the white in the furniture and accessories should still be more - it will help keep a fresh and bright look. It should be understood that the presence of only white or gray in the children's room will act overwhelmingly. In the nursery you need bright colors, but in the form of accents. Green, red, yellow and orange accessories and pieces of furniture that play the role of color accents will emphasize the simplicity of the color scheme of the interior. Scandinavians prefer to finish rooms without using expensive or complex materials. 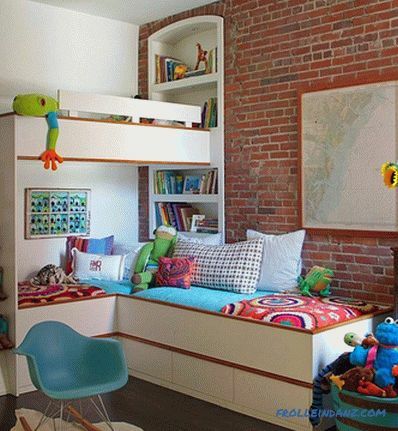 Simplicity is another feature of children's rooms, decorated in this style. 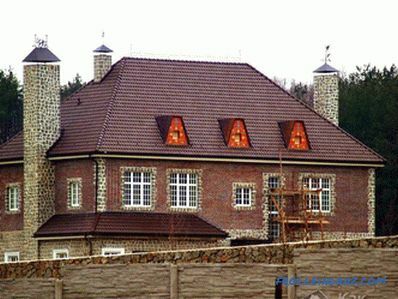 The ideal option for wall finishing is plaster and monochromatic painting. In some cases, one of the walls is glued with contrasting wallpapers imitating various materials, such as brickwork. 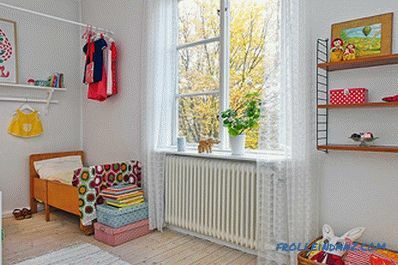 In many Scandinavian houses, walls are trimmed with panels, which, thanks to the repetitive vertical lines, look interesting enough, especially if they are painted in the usual white color. Try to decorate the walls (or one wall) of the nursery with such panels. 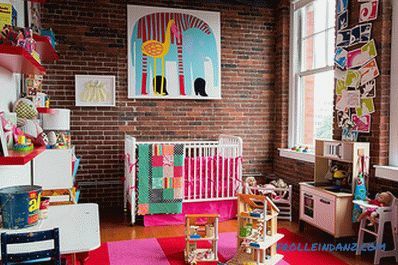 You should not create a multi-level structure in the nursery on the ceiling or lay expensive floor covering on the floor - the child simply does not need it. Give preference to the usual plastered ceiling and wooden floorboards painted white. 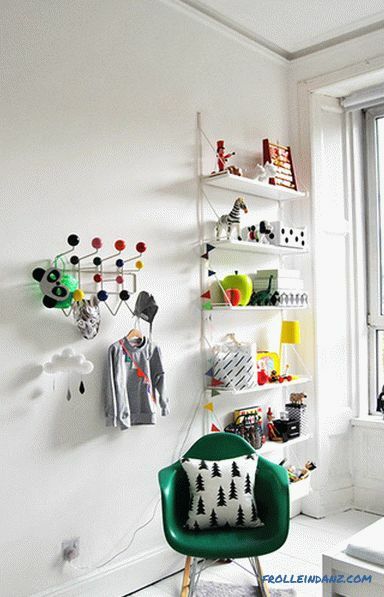 All furniture in Scandinavian children's rooms should be fairly simple, inexpensive, but functional. 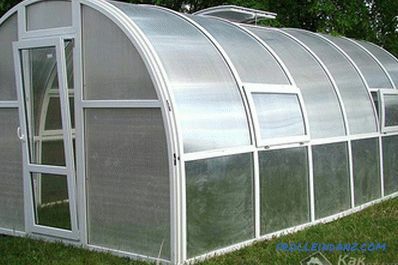 Its characteristic features are strict straight lines and blind facades. Beds can be bunk with drawers for storing clothes. As a bedspread usually use a bright blanket with an ethnic pattern. In children's rooms, as a rule, disorder settles very quickly, so it is especially important to have a large number of storage spaces. In this case, they should all be comfortable for children. First of all, we are talking about all kinds of baskets and drawers with lids that easily slide under the bed, as well as shelves that are hung so that the child can easily reach them. In the room for the older child, you will need to put a table where he will draw and do homework. An example is the modular storage system String - a classic of Swedish design. 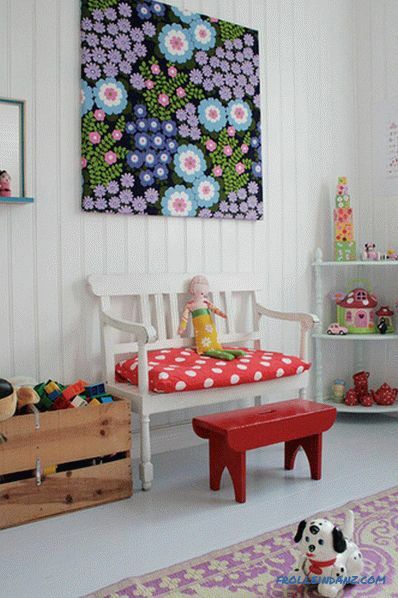 Ideal for the Scandinavian children's room, the decor is created with your own hands. It can be drawings and crafts of the child, as well as what his mother sewed or knitted - towels, blankets and even floor mats. 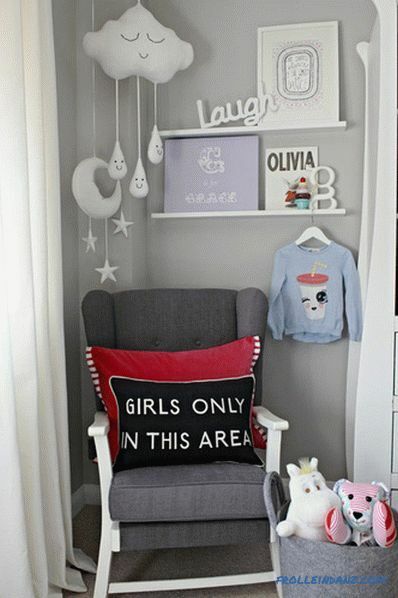 In addition, you can use paintings and posters with a children's theme for decoration. Often, the creatures of the Scandinavian-style children are met by forest creatures, from bears and wolves to owls and foxes. They should be made in muted tones in order to keep the airy white-gray palette and make the space cozy and friendly. Remember tactile touch. The texture is an important component of any Scandinavian interior, and even more so a children's room, because it brings tenderness and warmth to the living space. Use woolen and homespun covers. In this room, a rug and a cozy sheepskin cape on a chair made of light wood fit perfectly into the interior of a simple room, decorated in contrasting white and dark blue colors. Persistent Scandinavian-style supporters often do a hanger with hooks with their own hands, which is both a place to store and a decorative element. 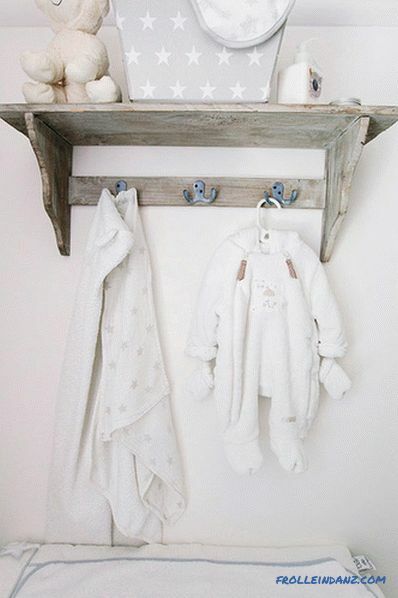 This hanger looks great on a plain white wall of a children's room and at the same time is very functional, especially with a convenient shelf on top. Scandinavian interiors do not have to be pure white; they often contain pattern and color. Ornament in patchwork style, colored "peas" and cheerful floral motifs in retro bright colors are simply created for the children's room.